Why do I wake up with heel pain? There are a number of possible causes of heel pain, but if you find that your discomfort is worst in the morning—especially the first 15 minutes or so after stepping out of bed—the likely culprit is plantar fasciitis. This condition tends to hurt worst in the morning (or after long periods of napping or sitting) because the plantar fascia, a band of tissue that runs across the bottom of your foot, tends to tighten and shorten when not bearing weight. Those first few steps can feature sharp pain before the plantar fascia slowly stretches back to a more comfortable length. Fortunately, this condition can be treated conservatively. If you notices the symptoms, visit Harvey Danciger, DPM in Palm Desert, CA—he’ll help you tailor a treatment plan right for your situation. Options include rest, shoe inserts or modifications, laser therapy, night splints, and other techniques. To set up an appointment at our Coachella Valley office, dial 760-568-0108 today. How long does plantar fasciitis take to heal? Getting sidelined by plantar fasciitis can be a frustrating experience. You understandably want to get rid of your heel pain and return to full action as soon as possible. While most people will eventually make a full recovery through proper care, the speed of doing so differs from person to person. Some cases respond quickly to treatment, while others don’t respond to conservative measures at all and may require special attention. Usually, common treatments such as night splints, laser treatments, insoles, rest, icing, stretching, and oral medication will be employed for about 6 weeks. With improvement, custom functional orthosis are needed. If no improvement in pain has been registered by then, additional methods such medicine injections may be considered. Immobilization, physical therapy, or even surgery may be options in the most chronic situations. Don’t wait if you have pain. The sooner it is diagnosed and treated, the more likely you are to recover quickly. Let Harvey Danciger, DPM help determine your best route to recovery. Call our Palm Desert office at (760) 568-0108 or use our online form to schedule an appointment. 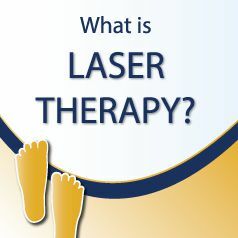 Laser therapy is a non-invasive, non-surgical procedure that can help reduce pain and discomfort from foot conditions that involve swelling or inflammation. If you suffer from plantar fasciitis, arthritis, bursitis, tendonitis—any “itis,” really—or other conditions such as neuropathy or sprains, laser therapy may help get you back on your feet. The laser uses specific wavelengths that produce strong anti-inflammatory and pain-reducing effects and stimulate cellular activity. As a result, it can help accelerate tissue recovery, close wounds, and even improve nerve functions when combined with a rehab plan. Most patients report significant pain relief after three or four treatments, and some people respond even more quickly. We offer laser therapy at our Palm Desert, CA, office. Call us at (760) 568 – 0108 to set up an appointment with Dr. Harvey Danciger today to see if laser therapy can help you with your foot, ankle, and heel pain. Why are my arches flat? Flat foot is a very common foot structure in which the arch of the foot has flattened and the entire sole of the foot touches the ground when standing. If you were to step a wet foot on dark paper you would simply see an oblong pancake shape. This condition can be present during childhood or adolescence, or it can develop over time. If you have developed fallen arches, it may be due to a weakening of the posterior tibial tendon that is the main support for your arch. Overuse or injury can impair the tendon’s ability to provide support and so the arch collapses and the foot flattens. The condition can also be related to age, as years of wear and tear can weaken tendons as well. In childhood, the condition is called flexible flatfoot and it is important to note that it often progresses in severity with age. We can provide excellent, effective care if you have pain associated with flat feet, as well as preventative care if you are looking to avoid foot pain. Contact Harvey R. Danciger, DPM at our Palm Desert, CA office by calling (760) 568-0108 today. How does laser therapy help my heel pain? Heel pain can develop due to strain on your foot or an injury such as plantar fasciitis. With laser treatment, a light beam is targeted directly on the affected tissue. The laser helps to reduce pain and inflammation, accelerates tissue repair, reduces scar tissue, closes wounds and improves nerve function. There is no pain or discomfort during or after the procedure. It may take three to four treatments before a decrease of symptoms are fully felt, however most patients feel a difference after the first or second treatment. Six treatments are needed. Any type of foot pain or discomfort can be frustrating and limiting when it comes to carrying out daily activities. At Harvey R. Danciger, DPM our main goal is to help patients live without foot pain. We strive to offer the best state-of-the-art treatments available. If you have heel pain, our laser therapy is fast and effective at resolving symptoms. Contact us today if you have been experiencing heel pain—our laser treatment may be right option for you. Call our office at (760) 568-0108. How can I prevent sore feet and legs due to flat feet? One of the best ways to prevent pain if you have flat feet is to wear shoes that will stabilize the foot and prevent excessive overpronation. When walking or running, good shoes will promote a healthier movement of the foot with each stride. Look for shoes with good arch support and a width to accommodate your foot size. A tight Achilles tendon can also contribute to overpronation, so exercises to stretch the Achilles will be effective against sore feet and legs. Rest and icing at the end of the day can also help soreness and swelling. Dr. Harvey Danciger can fit you with custom orthotic inserts, which are very effective in providing stability and support for patients with flat feet. Physical therapy may also be helpful. Call our office at (760) 568-0108 with any questions or concerns. We provide expert care if you need treatment for painful flat feet. What is that hard bump on the bottom of my arch? The hard bump, or nodule, may very likely be a plantar fibroma. Patients will come into the office concerned about a growth or lump on the bottom of their foot. They tell me they did not injure their foot and suddenly felt this growth. The do not know exactly how long it has been there, only that it is there now. More often than not, they relate that while they were bathing they felt this growth on their foot. Some patients tell me there is no pain involved, but others say it hurts with pressure or when they stand or put shoes on. An ultrasound exam can help determine what the growth is, the extent and size as well. It can help determine if the lesion is invasive or well localized. What is causing the pain in the back of my foot? The heel is most likely the source of pain in the back of your foot. Designed to provide support and absorb the impact when our foot strikes the ground, it can hurt for several reasons. One of the most common causes is an injury called plantar fasciitis, where the band of tissue that runs along the bottom of your foot and attaches to the heel bone is strained and inflamed. Your symptoms may be due to pressure from footwear, which can cause bursitis. A sac of fluid at the back of the heel called a bursa can become irritated and inflamed. Tarsal tunnel syndrome, which involves a pinched nerve at the back of the foot, is another cause for heel pain. A damaged Achilles tendon may also be the root of your symptoms. With so many factors involved, it is important to get an accurate diagnosis so you receive the right treatment. Call our Palm Desert, CA office at (760) 568-0108 to make an appointment with Dr. Harvey Danciger. Why is MLS Laser therapy so effective? MLS Laser Therapy, by CE lasers, is able to cause a strong anti-inflammatory, anti-swelling, and analgesic effects simultaneously and within a short period of time. LLLT (traditional low level lasers) cannot achieve these results because of their design and not being able to have the different wavelengths being synchronized. The patented control system that generates the MLS pulse synchronizes the emissions to achieve results that were previously unattainable. Thanks to this characteristic synchronization, the various therapeutic effects not only take place at the same time but also help to enhance the other effects. If you would like further information on how MLS Laser Therapy can benefit you in the Coachella Valley, call Dr. Harvey Danciger in Palm Desert at (760) 560-0108. How should I stretch my feet before activity? Regular stretching, on a daily basis and before activity, helps maintain the range of movement in your joints, keeps you flexible, helps your posture and can help prevent injury. It is often forgotten that feet are an important part of the process. Foot stretches help with current pain or problems and can prevent injuries from occurring. Before engaging in activity, one area to focus on is your calf. Stretching your calf muscles can reduce the amount of force that your heels and the balls of your feet have to endure. Lean against a wall and bring one foot forward. Keep the back leg straight with your heel on the ground and feel a gentle calf stretch as you lean. Stand at the edge of a step or ledge and allow your heels to lower. This will also stretch the calf muscle and the bottom of your feet. Be careful to be gentle with both exercises – you should never bounce. Before you put your shoes on, do a few toe exercises – rise up on your toes, point your toes and roll your foot forward to stretch the tops of your toes. Roll a golf or tennis ball under the ball of your foot to stretch the ligaments in the bottom of your feet. This is great for those who have arch pain or plantar fasciitis. Dr. Harvey Danciger has many other stretching techniques that can help with hammertoes, heel pain and Achilles tendonitis. Contact our office to learn more or to get treatment for your foot pain. Make an appointment online or by calling us at (760) 568-0108. Bone spurs can be treated several different ways. If the spur is getting pressure form the shoe, padding can be used to relieve the pressure. If there is too much movement in the bones around the joint causing the spur formation, using functional custom orthotic devises can a form of treatment to reduce stress and pain. If the spur is causing inflammation, bursa, or ganglions, then padding, anti-inflammatory medication, and/or cortisone injections can help decrease the pain and inflammation. Icing the area can also be beneficial. If conservative treatment is not affording enough relief, surgery to remove the spur can be done. Visiting your foot doctor in Palm Desert will provide you the answers as to why your bone spur has formed and what can be done for it. For an immediate appointment to learn all of your options contact Dr. Harvey Danciger at 760-568-0108. Why is my heel numb? If you are feeling numbness in your heel, it could be indicative of tarsal tunnel syndrome. There is a small space on the inside of the anklebones in which a main nerve called the posterior tibial nerve is located. This nerve can become compressed or squeezed resulting in pain and numbness in the heel. This can also be accompanied by tingling, burning and shooting pain. Tarsal tunnel syndrome can develop from a variety of causes. Flat feet, an enlarged varicose vein, a swollen tendon, an ankle injury or diabetes are a few common circumstances that can cause this condition. If you have persistent numbness in your heel, Dr. Danciger can find the true source causing it and provide the right treatment to relieve your symptoms. Call our office to make an appointment (760) 568-0108. How can I strengthen my flat feet? Having flat feet essentially means that the arches on the bottom of your feet are flat. If you were to stand up on the floor, the entire sole of your foot would touch the floor. For most people, having flat feet brings no discomfort or inconvenience. There are times though, if you are very active or involved in higher stress activities, that flat feet can become strained and cause pain in your feet and even your lower back. While sitting, rest one foot across the knee of the other leg. Grab your toes and bend them toward your shin to stretch your arch. Stand on the edge of a stair and lower your heels below the edge. This will stretch your arches and calf muscles. Stand with feet shoulder-width apart and rise up on your toes. Progress to doing this one foot at a time. Place a towel on the floor and using only your toes, scrunch it towards you bit by bit. These are just a few options to try but if you are feeling any persistent pain from having flat feet, come in and see Dr. Danciger. There are other treatment methods available such as custom orthotics to help support flat feet. Make an appointment by calling (760) 568-0108 or connecting with us online. Can wearing flip-flops cause heel pain? Heel pain, also known as plantar fasciitis, involves the thick band of tissue that runs from your heel, along the bottom of your arch to your toes. It is called the plantar fascia and it supports the arch of your foot. It is designed to withstand a great amount of pressure but repeated stress can cause it to become stretched, torn and inflamed. This is what is then called plantar fasciitis. Are my flip-flops the cause of my heel pain? There are many factors that contribute to this painful condition and flip-flops can be a culprit. Normal footwear has a good amount of cushioning and often a raised insole that supports the arch. Flip-flops are usually a flat pieces of foam or rubber that provide little to no support for your feet. The impact on your feet with each step in flip flops can lead to plantar fasciitis or worsen an existing condition. If a summer of wearing flip-flops has brought on intense heel and arch pain, you may have already fallen victim to plantar fasciitis. Dr. Danciger, podiatrist in Coachella Valley, can provide excellent treatment options to help you find relief. Call our office today at (760) 568 0108 to make an appointment or schedule an appointment with Dr. Danciger online. As with many foot conditions, leaving plantar fasciitis untreated may only cause the condition to worsen over time. Having pain in the bottom of your foot can inevitably cause you to limp or change the way you walk. This change in gait can lead to problems in your knees, hips and lower back. You may also experience long-lasting or chronic heel pain if you do not seek treatment for plantar fasciitis. Heel pain, also known as plantar fasciitis, develops when the plantar fascia on the bottom of your foot becomes strained and inflamed from overuse. This band of tissue runs from your heel, along your arch to your toes and when damaged, can bring significant pain. There are many successful, non-surgical ways of treating heel pain. Please call us for treatment if you are noticing pain in the arch of your foot or other symptoms indicative of plantar fasciitis. Call our expert podiatrist, Dr. Harvey Danciger, at (760) 568-0108 or schedule an appointment online. How can I prevent foot pain when standing all day at work? There are many occupations that have workers on their feet all day. If you have a job that has you standing for long periods of time, there are a few things you can do to avoid foot pain or reduce any current pain. Dr. Harvey Danciger, experienced podiatrist, suggests standing on an anti-fatigue mat if you stand in a stationary place. These mats can provide extra cushioning for your feet. Secondly, invest in footwear that fit your feet well and supports your foot structure. If you have flat feet or high arches, you want to look for shoes that will support your foot accordingly. Dr. Danciger has many patients who find the use of custom orthotics very effective. These are insoles that slip into your shoes to give your feet the alignment, support and stability they need to carry your weight all day. Stretching exercises before and after work will keep muscles warmed up and relaxed to be able to handle the stress of your job. Dr. Danciger can provide several stretching exercises and techniques to keep your feet pain free. Resting, elevating and icing your feet after work will also help reduce swelling from standing all day. If these treatment methods do not seem to be helping your foot pain or your foot pain is getting worse, please call Dr. Danciger for help. There may be a more serious underlying problem that needs to be addressed or a different treatment plan needs to be put in place. Contact his office by phone at (760) 568-0108 or schedule an appointment online. Why Do I Walk on the Inside of my Foot? We all have unique foot types just like we all share different hair and eye colors. How you walk is called your gait, and as you walk, your feet typically flatten when they hit the ground and roll inward slightly. This is called pronation. When you have flat feet, your feet tend to roll farther inward as you do not have a strong arch to keep this from happening. This condition is called overpronation. Take a close look at the insides of your shoes. Are they significantly worn down? This is a common sight among the shoes of over-pronators. It occurs when your feet roll in too much, causing the insides to take the brunt of the force during movement. Overpronation can also lead to other problems as the lower leg turns inwards during each step. You may also experience knee, hip and lower back pain as a result of overpronation. Dr. Danciger, foot specialist in Palm Desert, CA can perform a gait analysis and determine the structure of your foot and how to remedy a pronation problem. Shoe modifications and custom orthotics can make a big difference in how you walk and how you feel. Call our office today at (760) 568-0108 or set up an appointment online to take your first step towards living pain free. Can duct tape alleviate heel pain? There are several old wives tales for almost every ailment one could have. When it comes to feet, there are just as many “home-made” solutions out there. One that has surfaced is using duct tape to help alleviate the symptoms of plantar fasciitis. Plantar fasciitis can be a very painful condition and hinder your ability to work and exercise. While there are some ways that taping your foot can help, simply using duct tape across your feet is not going to do the job. Your foot health is important and resolving to use a quick fix will only do just that, give you a temporary fix. The best way to guarantee healing and true relief of painful symptoms is to have a foot care professional treat your condition. Plantar fasciitis can be helped with the use of custom orthotics, laser therapy and more. If you are having nagging pain from plantar fasciitis, skip the duct tape and make an appointment to see Dr. Danciger. Call our office today (760) 568-0108 or request an appointment online.